The White House has confirmed that Trump received a letter from North Korean leader Kim Jong Un on Wednesday. Trump proceeded to thank Kim for the “nice letter” and pointed out his “kind actions” after Kim returned the remains of 55 alleged U.S. soldiers. Yet, while Trump is busy thanking him, Kim is building nuclear missiles that can reach the U.S. While we all know that Trump and Kim are pen pals, Trump seems to be ignoring the fact that Kim is going against the agreement they made at the June summit in Singapore. At the summit, Kim vowed to work toward denuclearization in an agreement that was criticized for being extremely vague. Less than a month after the summit, satellite images revealed that North Korea was continuing to expand a key nuclear missile manufacturing facility. On Monday, U.S. spy agencies revealed they found signs that North Korea is building the country's first intercontinental ballistic missile that could be capable of reaching the U.S. However, Trump doesn't seem concerned about it in his tweet thanking Kim for the letter. A few hours before Trump sent out the tweet, Kim possibly came through on a different promise he made at the June summit – returning the remains of U.S. soldiers that died in North Korea during the Korean War. Vice President Mike Pence was in Hawaii to receive the alleged remains of 55 U.S. soldiers from North Korea. It's not hyperbole to note that Trump's bizarre adoration of dictators who falsely flatter him is a national security risk. 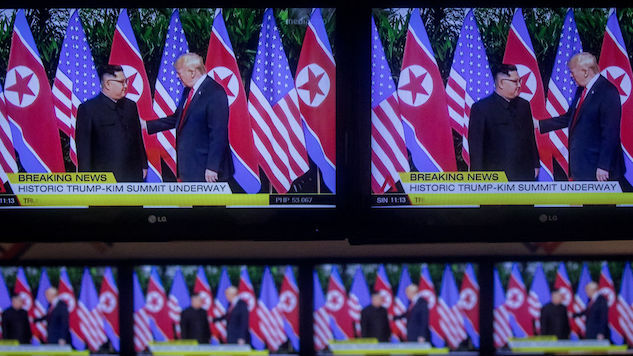 He continues to praise Kim Jong-un even as North Korea is reportedly accelerating its nuclear program, making new missiles, and continuing to pose an existential threat to several major American cities.